In 1896, the economist Vilfredo Pareto found that 80 percent of the land in Italy was owned by 20 percent of the population. Over time, others noted that the 80/20 rule applied more broadly to various outcomes in business and life, and his eponymous principle was born. The Pareto Principle states that 80 percent of the effects come from 20 percent of the causes, and asset-based loan origination is no exception. Maintaining a low friction environment between business development and underwriting to increase the frequency that what should close does and decrease the pain of rejecting what shouldn’t. High activity and tolerance for rejection are obvious prerequisites for success in any sales organization; but by taking time to plan market strategy, that organization can chase and win its share of the right business, and avoid some of the wild goose chases inherent to our industry. Such is the case when attempting to sell your term sheet in an efficient process for a financing need in which you have no edge. This type of sales victory occurs infrequently, and in today’s market it probably means you got there by pricing or structuring the deal down to the point of indifference. I have been a part of a sales-driven culture that thrived on winning deals by underpricing and stretching on structure – that experience ended in massive losses and my equity becoming worthless. 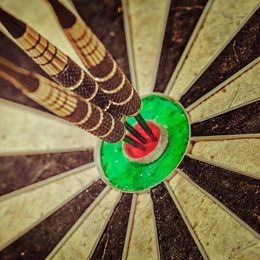 It is more strategically compelling to build by identifying your ideal targets, and then tailoring the process by which you serve them, finding some aspects that are difficult to replicate. Examples include firms that have expertise in monetizing specific types of collateral, cultivate hard-to-accumulate relationships in a specialized industry, or who have the operational capacity to accommodate out-of-the-box loan structures or timing needs. Firms that succeed in profiling themselves as the go-to resource for a specific need have the advantage of focusing on higher percentage pipeline, and deprioritizing the types of widely shopped leads that result in extreme competition. In today’s market there is no way to consistently win transactions without taking on some structural risk that you would prefer not to take. Differentiation provides a path to winning a higher percentage of what you want to win, being properly compensated, and avoiding the pyrrhic victories that often accompany the commoditized transactions. Having a distinct value proposition alone is enough to separate you from most in lending - but maximizing the conversion of opportunities with any consistency requires quality deal professionals to be selling that value to the marketplace. Non-bank ABL is a nearly 100% referral driven business – at a recent CFA conference, CEOs were asked who had ever experienced consistent success marketing to end borrowers and out of 30 firms represented, the answer was none. The transactional nature of our product makes us reliant on referral sources to drive pipeline. In a world where people only remember the last few people they’ve met, an ABL platform’s marketing message is only as good as its ability to have talented professionals engage with the people that matter and repeat the message about how and why the platform exists. In years of attempting to correlate the traits that lead to closed transactions, I have found that industry recognition, likeability and credit knowledge are weak predictors of success. The best deal professionals in ABL do two things well: 1) they maintain an activity based calendar and ensure they are touching the people that matter often in a unique and valuable way; and 2) they can clearly articulate their competitive advantage to the market and by repeating it to their relationships, they build a specific profile in the minds of the referral source community of what they do well and what they don’t. The best originators understand where their platform has edge, filter opportunities accordingly to avoid wasting time on low probability processes, and maximize their chance of success on the right situations. By knowing when to press both with the prospect and internally with their credit decision makers, they earn the credibility with the referral source to find out where they stand in a process, and often get last look. I am amazed by how often I observe a lender empower its front end team to aggressively pursue and win a deal only to have its underwriting team reject it in diligence for reasons that were apparent up front. Both sides resent the other, the prospect loses time and money, the referral source is left irate, and the direct competition silently rejoices over the unforced error. Platforms that succeed in converting an above average amount of signed term sheets have built their people and processes around joint buy in of the deal throughout its pipeline lifecycle. This means killing deals faster pre term sheet, but also obtaining early buy in from credit committee on issues that are best digested up front while the platform is still in marketing mode. It results in properly managing the borrower’s expectations in a process that ultimately requires understanding and compromise in order to close. A strong gauge of a platform’s alignment between business development and underwriting can be identified in the three days that follow a signed term sheet. A synchronized platform will exhibit strong knowledge transfer to the underwriter, prompt scheduling of third party work, and transparency to the borrower regarding process timeline, milestones and expectations. When that isn’t happening, it’s likely because the platform is working to get synchronized internally only after signing up the deal – a momentum killer that sets an ominous tone for the pace of underwriting. There are enough reasons that transactions die in underwriting; doing anything to break momentum or give borrowers time/reason to seek alternatives is fatal to successful underwriting conversion metrics. Clients have been trained to expect frictionless experiences in every single brand engagement. We have been indoctrinated to the super-convenient world of free shipping, no wait times and a hassle-free experience. Conversely, any business process with a high degree of pain points is inviting fall off in conversion metrics. Successful lenders remove those upfront barriers to increase conversion rates. No amount of strategy and execution will fully mitigate Pareto’s Principle. If we’re all not losing a lot of deals, we’re not pursuing enough deals. But those platforms that are clear up front on where they have edge, deprioritize situations where they don’t, and pair talented deal professionals with a synchronized process, are the ones positioned to build economic value while also entertaining the possibility that they’ll have some fun along the way. Mark Seigel is the President of Veritas Financial Partners. Veritas provides $2-20 million asset based loans for working capital, growth, turnaround, recapitalization and mergers and acquisitions. Working across various industries, Veritas serves entrepreneurs, management teams and private equity sponsors. Prior to Veritas, Seigel was chief investment officer of BMD Management Company, a private equity firm that managed assets for high net worth families. In this capacity, he was responsible for evaluating and overseeing public and private investments in the commercial real estate, specialty finance, and banking sectors. Seigel is a graduate of The Wharton School of the University of Pennsylvania.